Ever since my blog on Breaking the Law, I’ve been trying to go the speed limit. Do you know how hard that is to do—all the time? When is the last time you went 25 mph with no one in front of you? When I try it, I see nothing but headlights filling up my rearview mirror. There’s nothing like having impatient people on your you-know-what pushing you to move faster. As Christians, we can relate to this, can’t we? Don’t we have outside forces trying to get us to break the rules we’re trying to follow? We don’t even need those outside forces, do we? We do a good job messing up all on our own. We have our own pressure, within us, trying to get us to break the rules. I feel it when I try to drive 25. Now, I try to keep it at 5 mph over. I still have problems with impatient people wanting me to hurry up. And I’m already breaking the law. Here’s the problem with the path I’ve taken: I’ve already justified breaking the law. What’s to stop me from moving it up to 10 over? It’s just another 5, right? We may not agree with man’s rules. We may justify breaking them the moment they seem unfair. But where does that lead? Breaking more rules? When does it stop? We may not agree with God’s rules. But He is far…far…far… to the infinite power, greater than us. His rules are righteous. For our own good, we should try to follow them. I might feel I should try to follow the speed limit. But I will never condemn someone who doesn’t. I will try to love them where they’re at, be a good example, and pray God convicts them before they suffer negative consequences—even as they tailgate me. 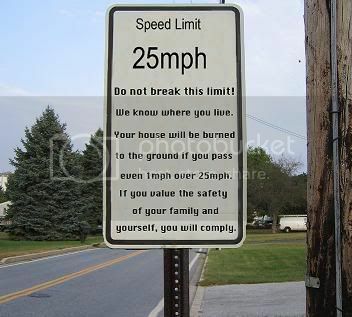 Just as I will try to follow the speed limit. Great post! I agree 100%...there are many people who do not follow God's "rules" as I see them, or even as church leaders see them. But that doesn't mean I/we should condemn those people. It' clear to me that you have a heart of LOVE, Jen. You may feel strongly about something and if it isn't how someone else feels, you'd still be nice to that person. Too bad we can't all be nice like that. The best way to persuade someone that your way is correct or better is to win them over with kindness. Keep up your kindess!